Madison County Tourism, the county’s official tourism promotion agency, recently named Barbara Giambastiani Bartlett as the recipient of the 2017 Emily Marshall Champion of Tourism Award. 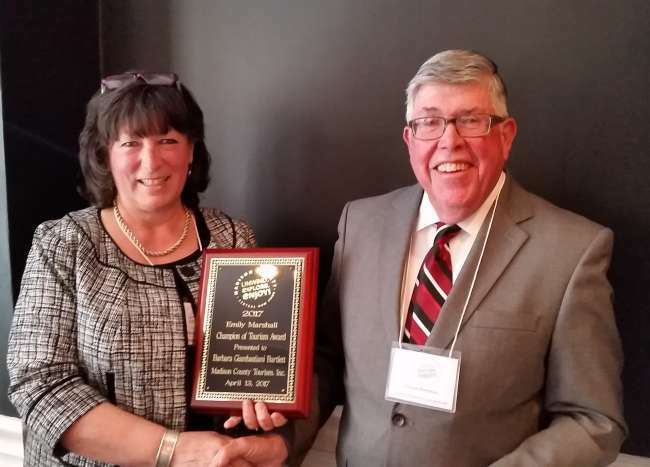 The award was presented to Bartlett, who recently retired as the Executive Director of Lorenzo State Historic Site in Cazenovia, during Madison County Tourism’s annual dinner on April 13 at the Colgate Inn in Hamilton. Bartlett was recognized for promoting cultural heritage tourism during her distinguished career. Bartlett, a Madison County native, first served as the Director of the Madison County Historical Society. Her early volunteer efforts and savviness assured that the Madison County hop collection was not only preserved but studied, leading to several heritage hop projects. In Bartlett’s more recent position leading Lorenzo State Historic Site, she helped interpret the legacy of five generations of the Lincklaen/Ledyard family. Bartlett also served as the Chair of the Madison County Cultural Heritage Tourism Committee and as a board member for the Greater Cazenovia Area Chamber of Commerce, the Upstate Institute Community Board at Colgate University and Madison County Tourism. She is also a member of the Cazenovia Arts and Heritage Alliance. At the state level, Barbara served with distinction as chair of the Central New York Path through History Committee, facilitating I LOVE NEW YORK interstitial ads, which advanced tourism in the region. Also at the state level, Barb was a founder and board member of the New York Cultural Heritage Tourism Network, serving as the organization’s first Vice President. Nationally, Bartlett advances Madison County’s assets through her work as a trustee and officer of the Mid-Atlantic Association of Museums. The Emily Marshall Champion of Tourism Award is given annually to those who have had a significant impact on the tourism industry in Madison County. The award’s namesake, Emily Marshall, was a founding partner of Madison County Tourism. Tourism is a vital industry in Madison County. According to data from Tourism Economics, visitors spent an estimated $84.5 million in Madison County in 2015. This tourism-related revenue generated local property, sales and occupancy taxes totaling nearly $5.8 million, which saved the average Madison County household $389 and sustained more than 2,000 jobs in the county. Photo Caption: Truman Hartshorn, Vice President of Madison County Tourism (right), presents the Emily Marshall Champion of Tourism Award to Barbara Giambastiani Bartlett (left), recently retired Executive Director of Lorenzo State Historic Site in Cazenovia during Madison County Tourism’s annual dinner at the Colgate Inn in Hamilton.